on November 19, 2018, 8:55 a.m. The modern day consumer cares about a brand’s products often as much as they care about what a brand does and communicates. As mainstream brands progressively move towards communicating their position on social and sometimes political issues, both through messaging and sometimes influential celebrity endorsements, YouGov decided to look into the best ways brands can engage with their customers in this approach, whilst also highlighting what to avoid. 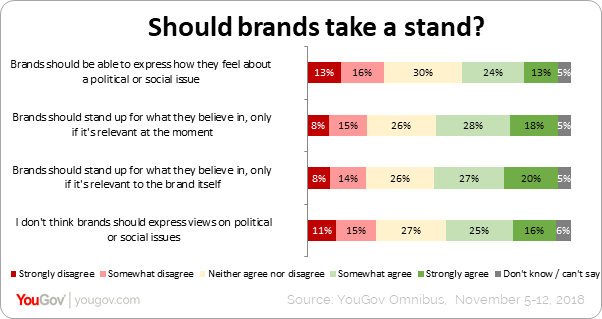 A recent YouGov survey reveals 63% respondents feel it is important for brands they like/follow to have a point of view on issues related to society. This comes across as being more important amongst males in the region (65%) and millennials in the age bracket of 25 -34 years, with over two-third of them expressing this. When looking at nationalities, Asian expats featured most prominently, with 70% feeling brand expression is important when compared to people belonging to other nationalities. Interestingly, nearly half the respondents (47%) believe that brands should take a stand only on issues that are either relevant at the moment or that are relevant to the brand itself. On the other hand, 42% respondents agreed that brands should refrain from expressing their views on political/ social issues. This emerges strongly for adults in the age group of 35-39 years, with 46% looking at this in a negative light. Close to half of Arabs (44%) and Asian expats (42%) also feel the same way. When asking those who feel it is important for brands to have an opinion on society-related issues, more than half (57%) feel brands are obliged to do so as they are able to reach out to the mass public. Close to half (48%) reported them wanting to trust the brands they interact with as being another reason for them wanting brands to take a stand. Only a small proportion (18%) stated turning away from businesses who have values they disagree with. What should brands talk about? Education, Health awareness, Environmental and Human rights emerged as the top areas respondents find acceptable for brands to communicate their point of view through marketing campaigns. It is interesting to note that women felt more strongly about brands promoting health issues compared to men. For young adults in the age bracket of 25-29 years, Education and Health are the most acceptable areas for brands to express their views on. LGBTQ rights and political opinions are the least favoured areas for people to accept a brand’s stand on. This is standard across all demographics but especially among Arab expats who place it lowest on their list of priorities. Talking about their own behaviour towards brands that take a stand on certain issues, nearly half claimed they would publically praise/ promote such brands (48%) and would be more likely to buy from brands that express views they are personally in agreement with. Close to half (47%) also said that a brand’s stance on an issue enhances their loyalty towards that brand. Interestingly brand loyalty goes further than just the love of a product with 43% indicating that those they are affiliated with pushing a specific agenda could influence their opinion. This was more prevalent among those aged between 30-34 years and the Asian expat population (49%). So should brands take a stand? While there is strong support for brands voicing their opinions, 51% also believe that brands do take advantage of social issues to promote themselves and exploit their audience. For a quarter, trusting a brand’s point of view depends entirely on the social/ political issue at hand. Notably, 23% stated they are more likely to trust a brand that promotes messages on such issues regardless of the overall impact on the brand itself. Asian expats seem to have a particularly strong opinion on brands taking a stand and are also sceptical of a brand’s motive for doing so. Not only are they less receptive of brands expressing their views on issues, over half of them (55%) are in agreement that brands take advantage of social issues to promote themselves. A quarter of them stated being more likely to trust a brand that speaks on an issue irrespective of the effect on the brand. Lastly, when it comes to taking a stand on an issue, rolling out marketing campaigns in support of the cause (36%), sharing examples of their support/ action towards it (33%) and announcing a donation in support of the cause (31%), come out as the most effective ways for brands to take a stand. Interestingly, among Asian expats, there clearly lies a gap in trust or transparency with 40% stating that sharing examples of a brand’s support/ action towards a cause is the most ideal way to establish a stand. Data collected online by YouGov Omnibus among 1,003 respondents in the UAE between 5th and 12th November, 2018 using YouGov’s panel of over 6 million people worldwide. Data is representative of the adult online population in the country.